You are not taking an entrance exam. You as well are not attending a job interview, nor defending a college paper. You are neither scheduled to be heard in court. You do not have to feel tensed. It’s grocery shopping, a common errand, which you can survive without losing your sanity. Yes, dear parents. It is possible to grab groceries without arguing with the kids, and having to go back and forth to pick up items you have forgotten. Failing to prepare is preparing to fail. Before you set out to the market or grocery, ensure to list down everything you need. Let us put emphasis on the word need. Plan the menu you will be serving the entire week or until the next time you are hitting the grocery. Then, study the ingredients you need. Check your cabinets and refrigerator so you can identify items you are missing out on and which you still have. Speaking of which, it helps that you check out the expiry date of your supplies so you can prioritize using those that are nearing their expiry date. Focus on meals using these items so they do not end up at the trash. Follow the same procedure in determining supplies that need replenishing. You need not bring their favorite toys with you. You also do not have to play hide and seek with the kids, making believe the grocery’s a gigantic playground. You can keep your kids entertained by assigning them tasks or simply challenging their abilities. For instance, since they probably are still learning to count, you might want to ask them pick a certain number of this and that item and place it in the cart. Then, go double check whether they did the counting right. Make your trips to the grocery educational ones as well. Help your young ones familiarize themselves with various vegetables and fruits. Let them name colors. See to it that you are hitting the right timing so as to avoid further headaches. For instance, do not go to the grocery when the kids are supposed to be sleeping or playing with their peers. Take them with you right after you have enjoyed a meal to keep them from requesting too much. You know that time of the day when they are in good mood. Take advantage of it. You are also aware what makes them tick, like promising you will watch their favorite videos together if they behave well at the grocery. Scaring kids would not always do the trick. Praise kids for good deeds. 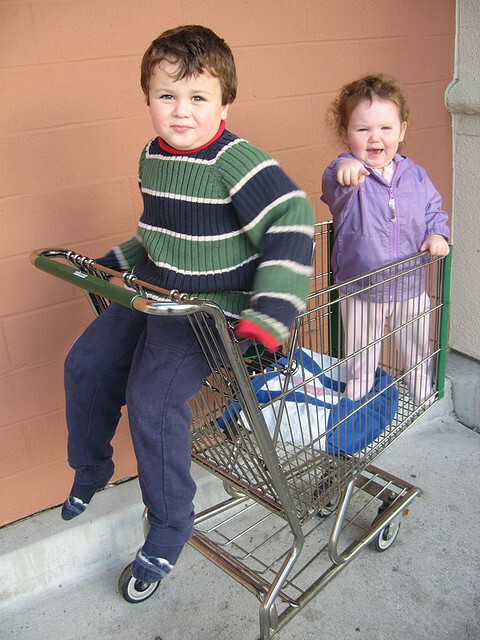 And, most important, do not forget to reward the kids for behaving well at the grocery. The more you praise them, the more they are likely to continue behaving pleasantly. So go ahead let them know they are doing a great job and think of the best, most accessible reward you can give them right after. It saves you time stacking coupons ahead of time. Look into the coupon’s expiry date so you can use them before they lose their value. This way, you can easily pull out those that you will need for the day’s grocery shopping. The danger with taking with you your entire coupon organizer is that you might lose some or overlook those that you should have prioritized using. Nettie Gray would let kids she takes with her to grocery hold the shopping list. Makes the roaming more fun as the young ones are challenged locating all items on the list.